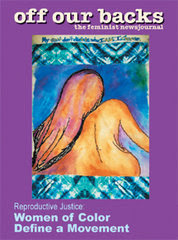 I bought my copy of the most recent issue of off our backs this week, and it turned out to be an entire issue dedicated to “reproductive justice.” The concept of reproductive justice, it turns out, is a way to re-vision the depth and breadth of what we have conventionally thought of as “reproductive rights” or even more narrowly, “pro-choice” advocacy. It focuses not only on or legal access to reproductive choice, but also on the social and economic inequalities that make those “rights” the privilege of those with power and resources. I read Ross’ article, “Understanding Reproductive Justice: Transforming the Pro-Choice Movement,” just a few days after reading a lovely essay, “Being a Radical Doula,” by a Maria Perez, a young woman who works as a doula supporting women during pregnancy, childbirth, and early motherhood. In “Being a Radical Doula,” Perez articulates the fundamental connection between her pro-choice politics and her passion for working with pregnant and birthing women. Both of these articles came across my desk just when I needed them, after several long weeks of going back and forth with anti-abortion folks about the abortion ban. It’s wonderful to know there are other people out there working hard to create a world in which reproductive justice is a basic human right for all. And I keep thinking . . . perhaps in my grannyhood, I’ll become a radical, activist midwife myself!